Washington State’s move to extirpate an entire pack of wolves near the Canadian border for the infraction of killing a few alien domestic cattle grazing public lands is reprehensible. That wildlife agencies would kill any wolves to benefit the profit margin of private businesses utilizing public resources is an outrage. George Wuerthner writes how the tragedy of this slaughter of wild predators repeats itself over and over throughout the West. 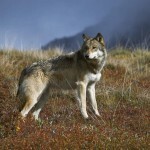 Washington Department of Fish and Wildlife has ordered that the Profanity wolf pack in northeast Washington be killed. The kill order is the result of on-going depredations of domestic cattle that are being grazed on [Colville] National Forest lands. The continued [helicopter] killing of the Profanity Peak Pack is emblematic of what is wrong with our wildlife policies, especially with regards to public lands. What about protecting wolves from repeated depredations by livestock? What about preserving the ecological role of large predators on our public lands? Public Purpose: Cattle Ranching in National Forests? The typical reaction of state wildlife agencies to any predator conflicts is to remove the predators, rather than remove the livestock. However, grazing on public lands is a privilege, not a right. While livestock grazing is a legally permitted use of public lands, that use is contingent upon livestock production not harming other public values. In this case, the killing of a wolf pack is an obvious harm to the public’s right to have healthy wildlife populations on our public lands. But it goes beyond simply the killing of our wolves so that a commercial business can profit from exploiting our public lands. The mere presence of livestock socially displaces the prey of predators. Elk and other herbivores avoid areas that are being actively grazed by domestic livestock. This means that predators like wolves may have to travel further to find food or alternatively they simply take the easiest and closest prey which may be domestic animals. Washington Department of Fish & Wildlife authorized field staff to kill the Profanity Peak wolf pack to prevent more attacks on cattle in the rangelands between Republic and Kettle Falls. 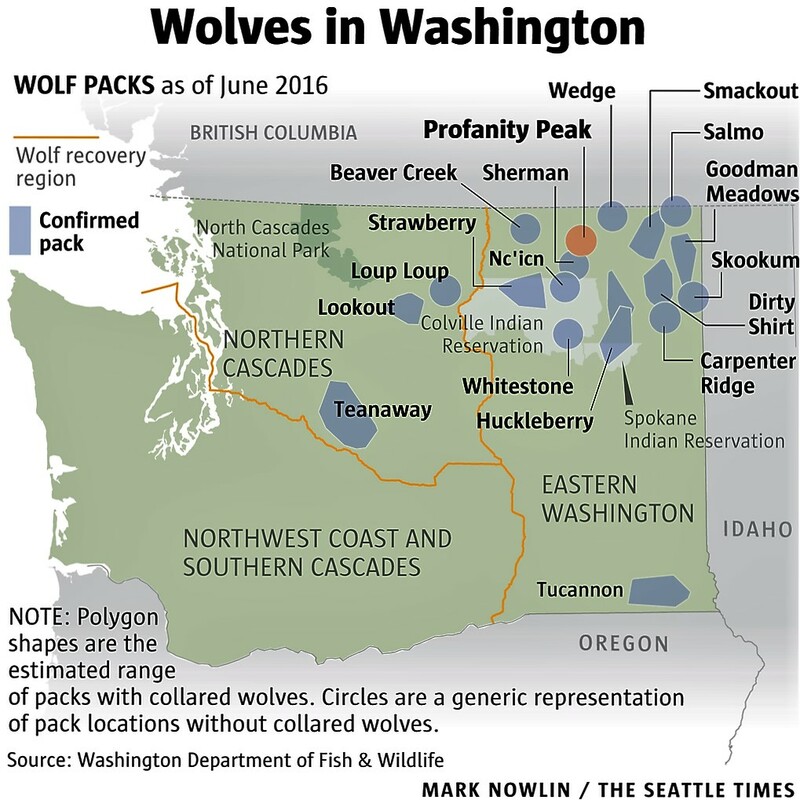 The state is home to at least 90 wolves and 19 packs as of early 2016. Of course, by consuming the forage on public lands, domestic livestock are taking the food out of the mouths of wildlife like elk and other wildlife that support predators like wolves, cougar, and coyotes. Furthermore, there is growing evidence that killing predators does not solve answer conflicts in the long run. Killing predators can fragment packs, or eliminate the more experience hunters in a pack. Indiscriminate killing of predators as is common in Idaho, Wyoming and Montana also destroys the social bonds in packs, and skews packs towards younger animals. The remaining pack members may be less experienced at hunting and may not know the territory and information like where prey may winter or migration routes that is critical for a successful pack. In reality we should be demand that livestock be removed from public lands whenever there is a conflict, rather than killing our wildlife. Ethically we can ask why a private business exploiting our public lands should be given preference over the public’s interest in wildlife like wolves. A long-term solution to conflicts between private business interests and the public interest in preserving its wildlife can be accomplished through permit retirement. Permanently closing allotments precludes future conflicts forever and provides ranchers with a golden saddle. They can use the money to retire, or buy additional private lands. Strategies like range riders, or other ideas that some organizations support to reduce conflicts does not really make the public lands safe for predators—our wildlife. Harassing public wildlife to facilitate private use of our public lands is ethically wrong in my view. In the end, we should be working to provide safe havens for predators so they can exert their evolutionary influence on the landscape. Permit retirement is one way to help achieve this goal. George Wuerthner is a former hunting guide with a degree in wildlife biology. He has published 36 books including Wildfire: A Century of Failed Forest Policy. He serves on the board of the Western Watersheds Project.